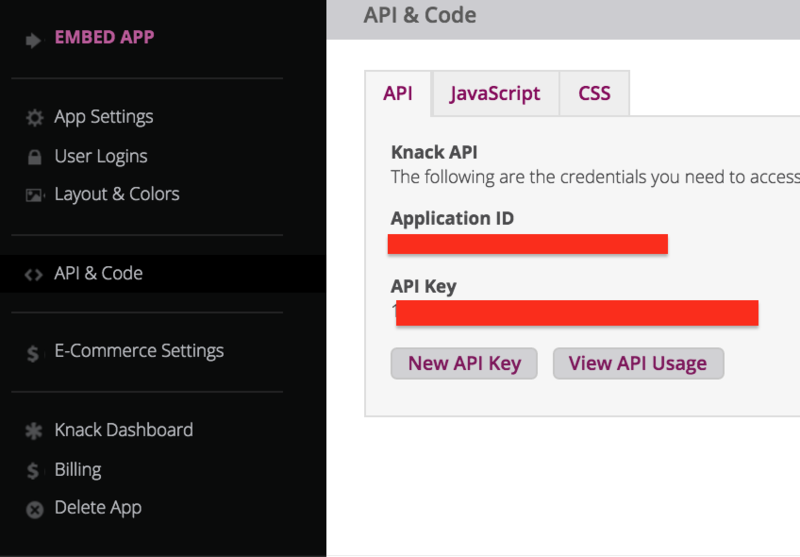 Knack is loaded with features right out of the box that make it simple to build powerful online database apps. What can be easy to forget is how much more power you can add by integrating other services with your Knack database. 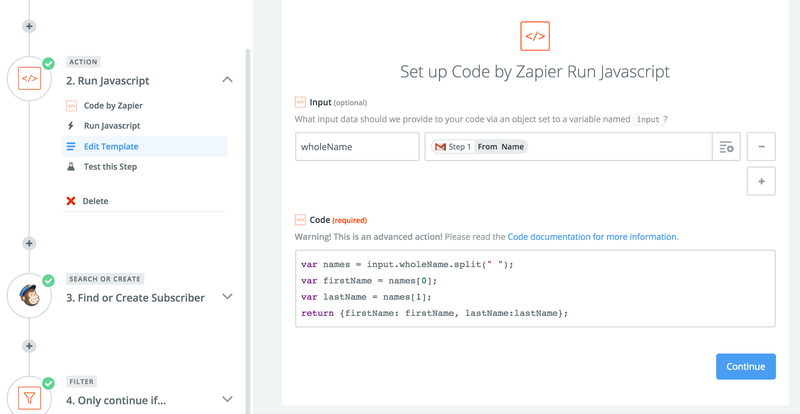 Our API makes it easy for developers to add integrations, and Zapier is great for creating simple connections and triggers between these services. 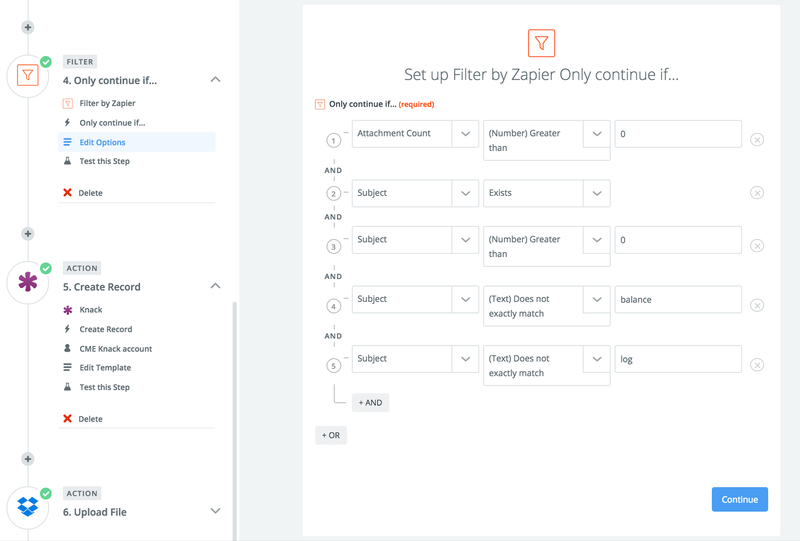 In our first guest blog post, Alex Mohseni explains how he used Knack and Zapier to build a TripIt like clone to help manage education credits. Alex is a practicing Emergency Medicine physician around Washington, DC. He integrated Knack with services like DropBox and Mandrill to combine their functionality into a single powerful service that gave him the exact features he needed. Part of what makes Knack so powerful is that it integrates easily with Zapier — but how to do that can be a bit tricky, so Alex decided to include some of his “lessons learned” with a fantastic tutorial. I am not a programmer; but, I am a physician who is easily frustrated by inefficient processes, and I like to solve problems myself. A few months ago, I decided to solve the following problem: all physicians have to track their continuing medical education (“CME”) credits, in order to maintain their licensure. Invariably, keeping track of one’s CME credits ends up much like keeping receipts for your income taxes: you stuff receipts into a box and pray that you have captured everything. Rejecting this workflow, I decided to build a better system. 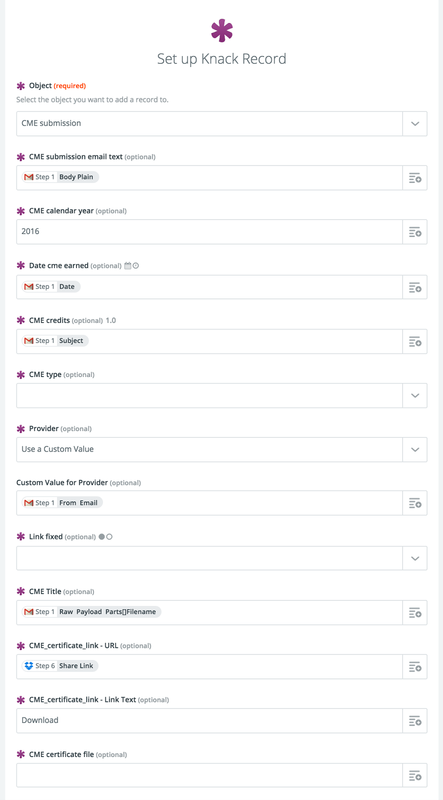 What I planned to do was simple: just like TripIt, in which one can forward travel itineraries to plans@tripit.com and have one’s travel data aggregated automatically, I wanted to forward my CME certificates to an email address and have my CME captured and organized automatically for me. Additionally, I wanted this service to work for any physician, even if he/she had not previously signed up with my service. 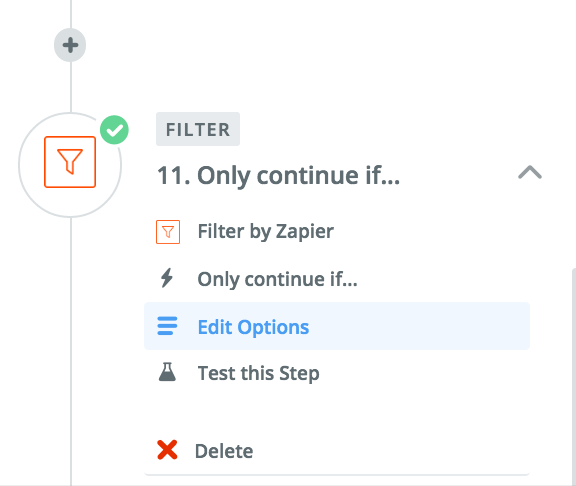 This workflow is only possible because of Zapier’s multistep zaps. Below, I will show each step of my multistep zap that performs the above workflow. 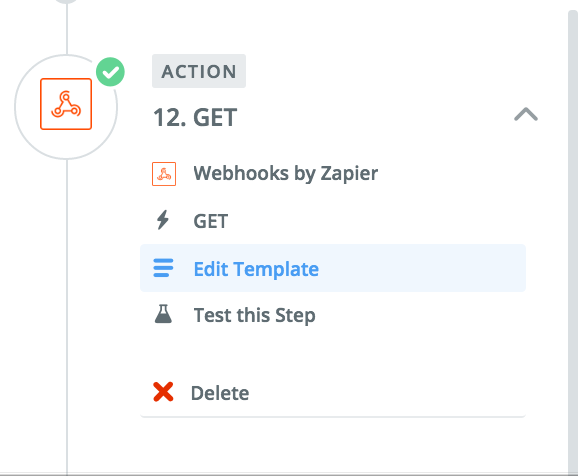 This demonstration assumes a basic working understanding of Zapier. 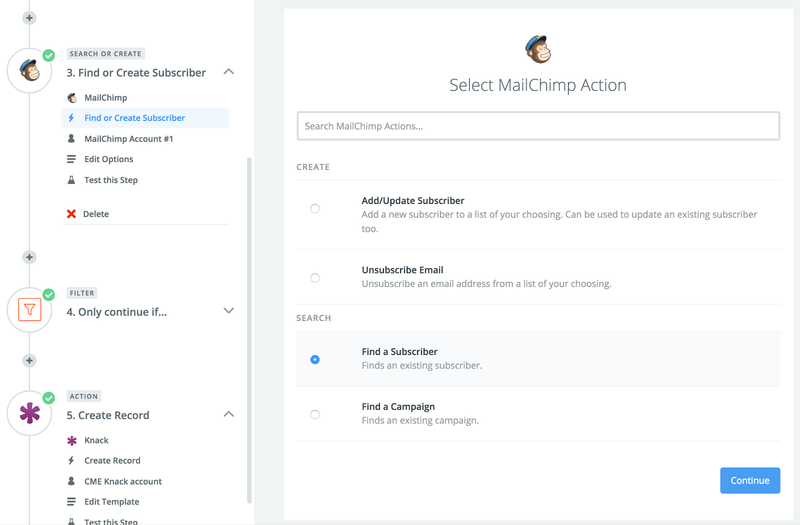 The first step is to trigger the multistep zap when a new email is received. 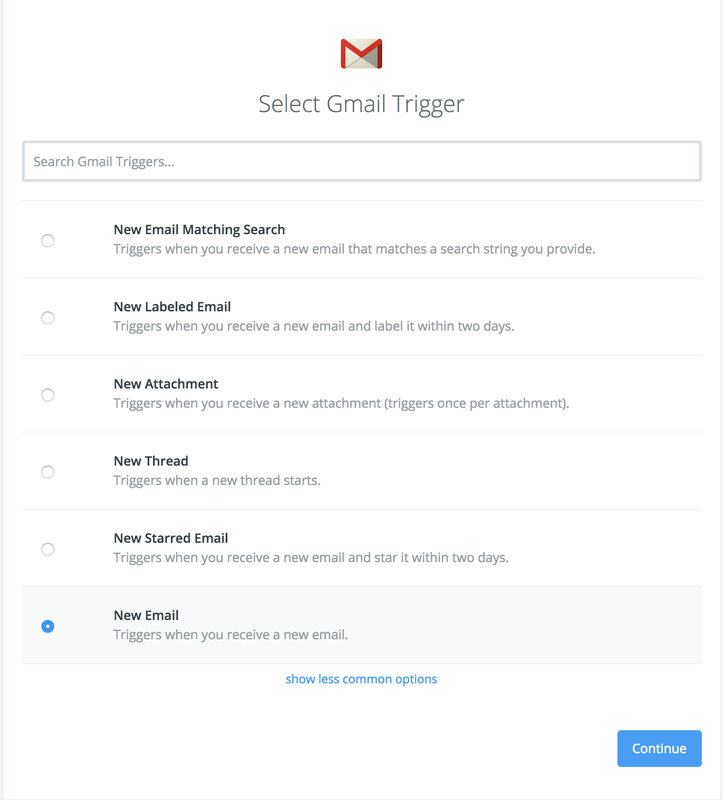 My email provider for CMElog.org is Gmail, so I use the Gmail trigger. I set the option for new emails in the Inbox. So now, I can access the first name and last name as separate data points. As you can see, if the sender does not already exist in my list, then he/she is added. 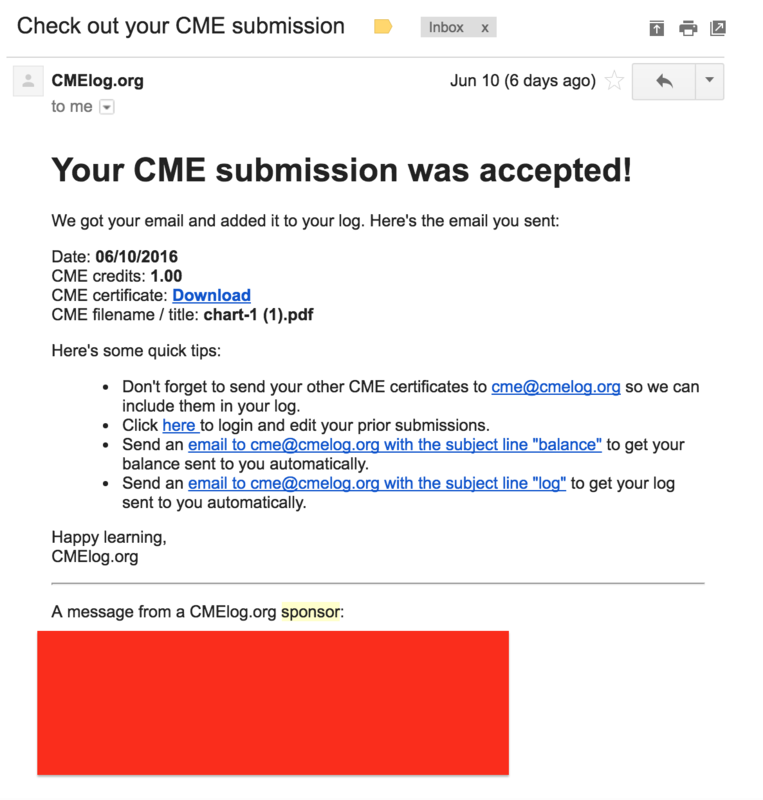 What if somebody sends me an email that is not a CME certificate (e.g., an email just asking for help with the service)? I need to make sure that the rest of the zap only applies to emails that have CME certificates as attachments. I used the Zapier Filter action for this. And, to understand my filter a bit better, I asked all my users to include the number of credits in the subject line of their email. Therefore, if an email does not have a number in the subject line, then it is not a properly submitted CME certificate. As you can see, the filter checks to make sure that there is 1) at least one attachment, 2) there is a subject in the email, 3) the subject is a number greater than zero, 4) and the subject is not two of my other special terms (“balance”, and “log”). If all of the above filter parameters are met, then the multistep zap continues. 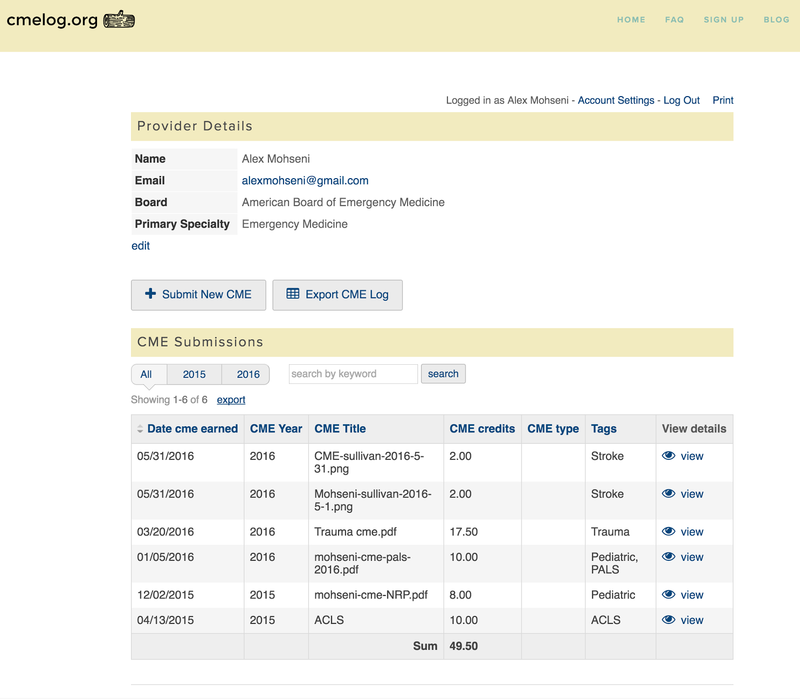 As you can see, I can see a table of my prior CME submissions at the bottom, my personal details at the top, and buttons to submit new CME and export my CME log in between. 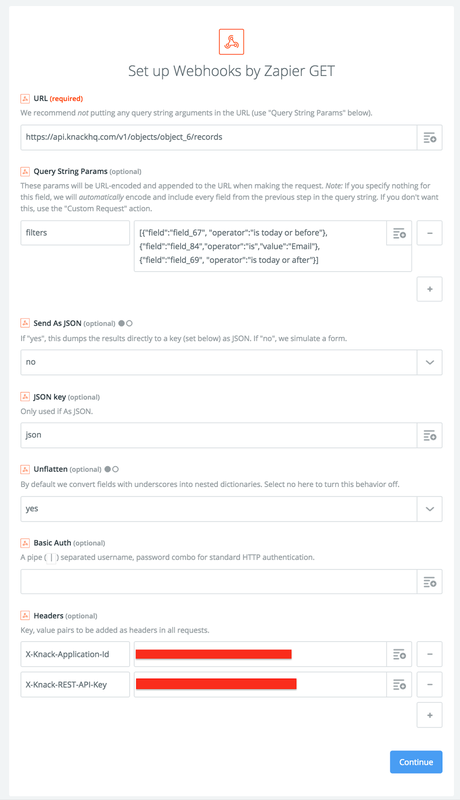 When uploading a document (such as a CME certificate) to Knack via Zapier, if the record is to have a connection, such as to a user, then that user needs to exist first. Meaning, you can’t create both a new user and connect the certificate at the same time. This is obvious in retrospect. 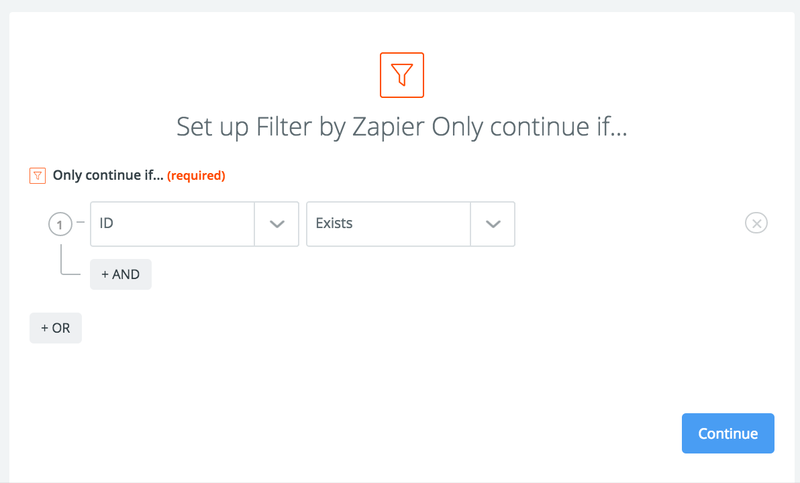 When uploading a certificate into Knack via Zapier, I could not perform a search first, in order to see if the sender was already in my Knack database (“create record” is the only option currently). The ideal workflow would have been to check Knack to see if the user already exists, and if he doesn’t, to create an account. The solution was to attempt to create a new user account for each email. Either of two things happens: the user already has an account, in which the account creation zap step fails, but the zap continues, or the user doesn’t exist, and a new account is created for that user. This is not an elegant solution, because it means I get a lot of “zap error” messages, when the zap is correctly identifying that the user already has an account in Knack, but I just ignore these until I build a workaround. You can’t send the actual file attachment through Zapier to Knack, but you can send a link to the file. I wanted to make sure that I have an spreadsheet with all of my users. 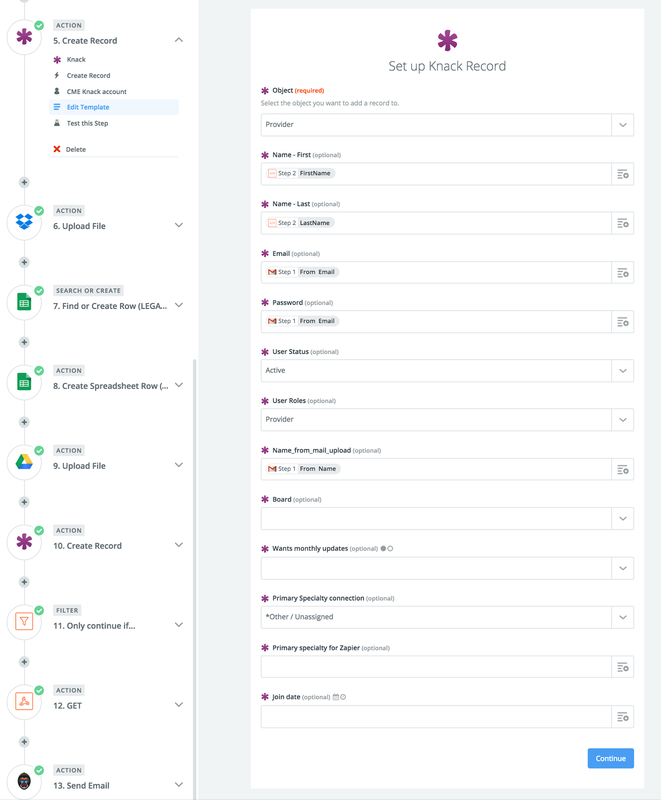 In order to do this, I used the Google Sheet “Find or Create Row” action, which is a legacy action now. Nonetheless, it’s pretty simple: first lookup if the user is already in the list on the sheet, and if not, add the user. This is very similar to Dropbox. In order to connect this CME record to the right user in Knack, I have to have a connection field, and that field needs to be something I can input via Zapier. For this reason, I use the user’s email address as the connection field. Also, I had to create two separate “file” fields in Knack for each CME record. 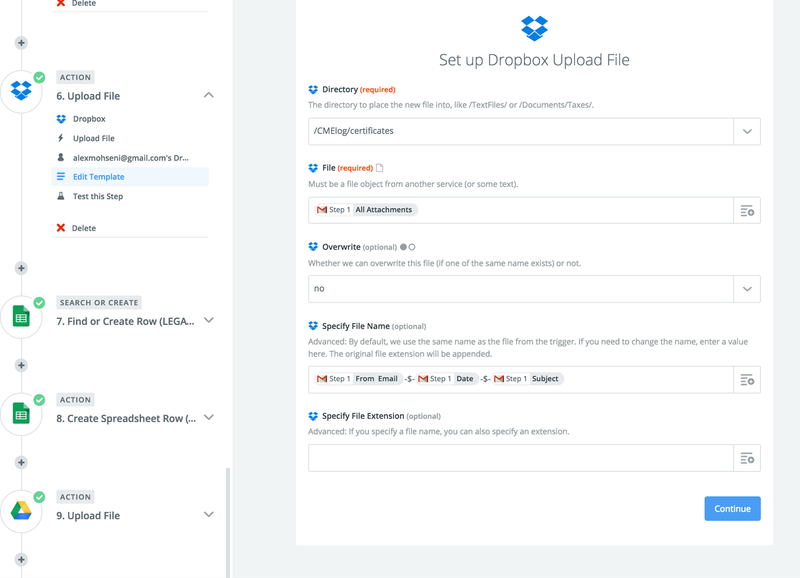 One field is actually a link field, to store the link to the file in Dropbox. The other field is a true Knack file field, for those users who upload their certificates directly in cmelog.org. Next, I used the Filter action to make sure that the record was successfully uploaded into Knack. I do this by checking to see if an “ID” exists for the record that I just attempted to create in Knack. I have a table of sponsors for cmelog, and their information is stored in Knack. I show different sponsors’ information in my transactional emails on different days. 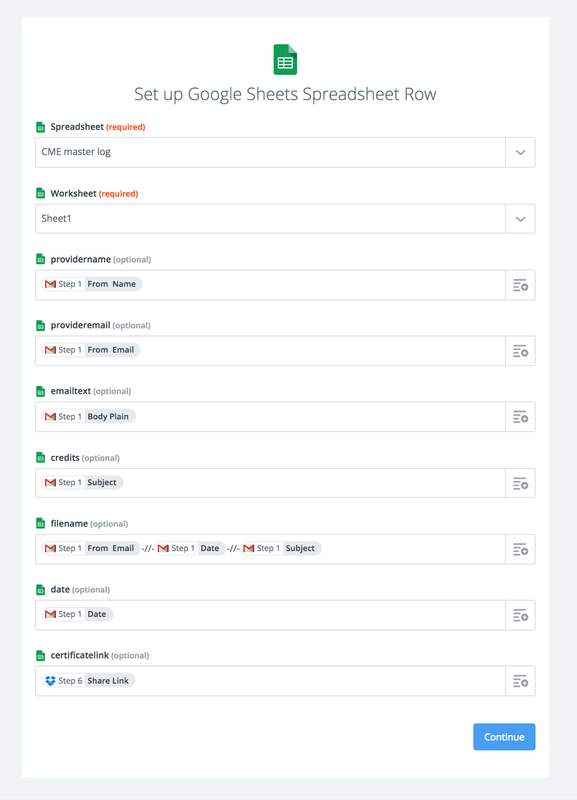 Somehow, I needed to access this information from within Knack via Zapier. 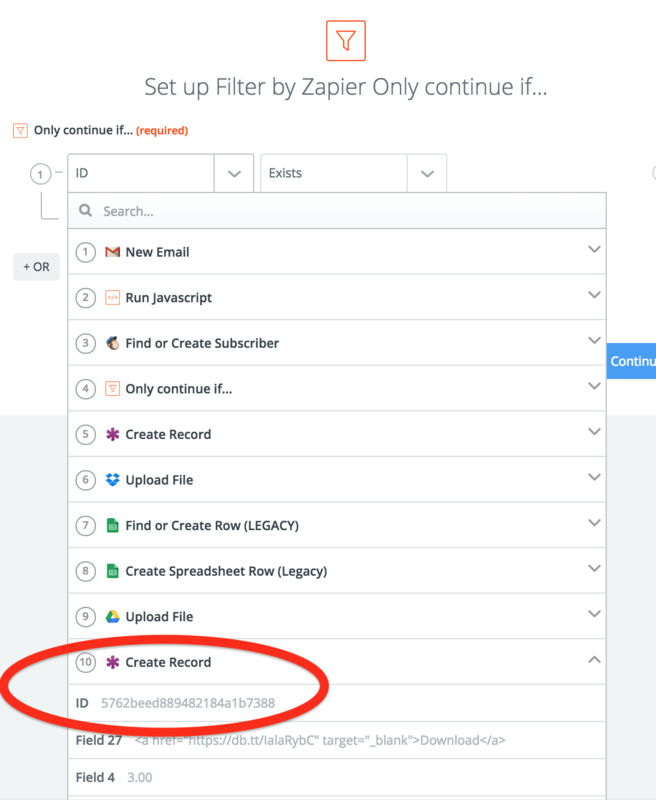 This, for me, was one of the trickiest things to do, as Knack’s Zapier actions currently are limited to “Create Record”, not to read records. I decided to use the Webhooks function, using a GET command. Finally—we have extracted all of the relevant user data, uploaded the attachment to Dropbox, created the user account in Knack, created logs and backups, uploaded the CME data to Knack, and verified the upload—we are ready to send a confirmation email back to the user. I hope the above explanations and screenshots help other non-programmers build awesome tools that help all of us be happier and more efficient. 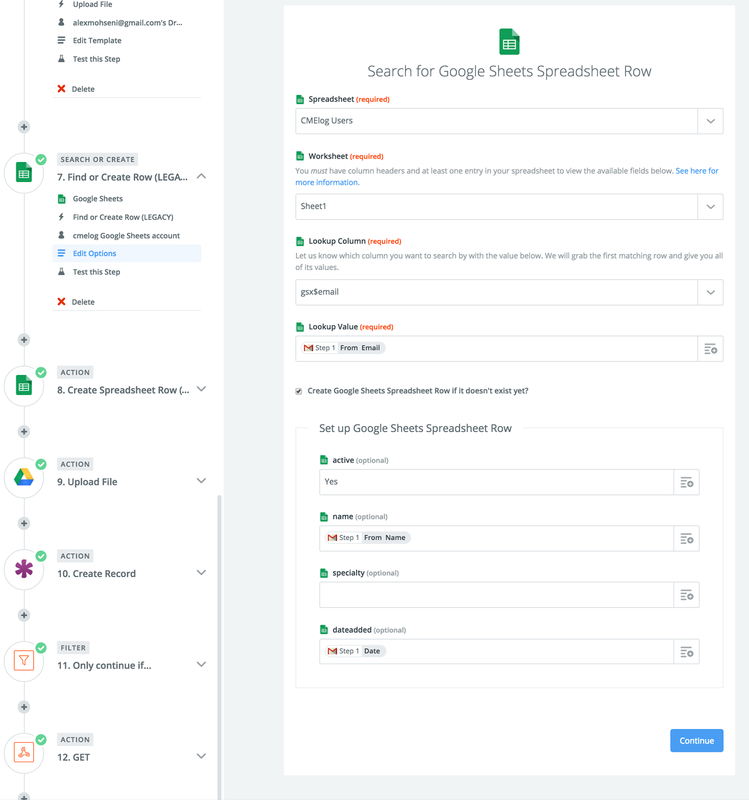 I could not have created my service without Knack, Zapier, and Dropbox, and am so grateful for their support in building cmelog.org. 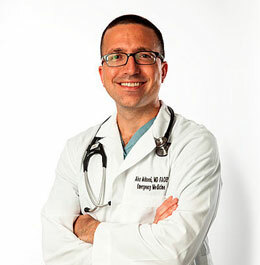 Alex Mohseni, MD, is a practicing Emergency Medicine physician in the Washington, DC, metro region, the Chief Innovation Officer for Emergency Medicine Associates, founder of CMElog.org, and the technology writer for Emergency Medicine News. He has been using Knack to build solutions for multiple healthcare and business related applications for more than one year, including solutions for managing employee expenses and company-wide performance dashboards. He can be reached at @amohseni, via email at alex at cmelog.org, or on his personal blog: CreativeHealthLabs.com.